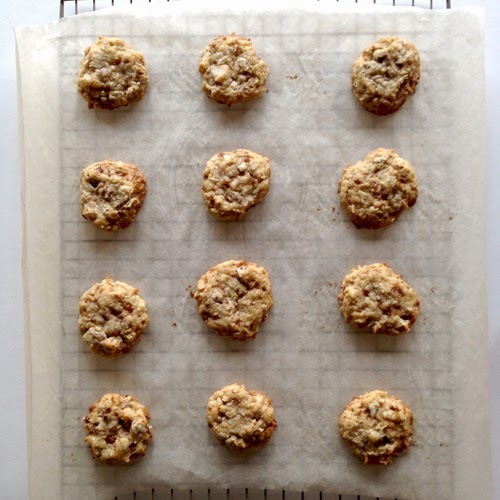 These cookies have a deceptively unassuming appearance. They aren't attractive, studded with chocolate chunks, glazed or sprinkled. They just kind of look like beige oatmeal cookies, but that's NOT what they are. There is no oatmeal in here. 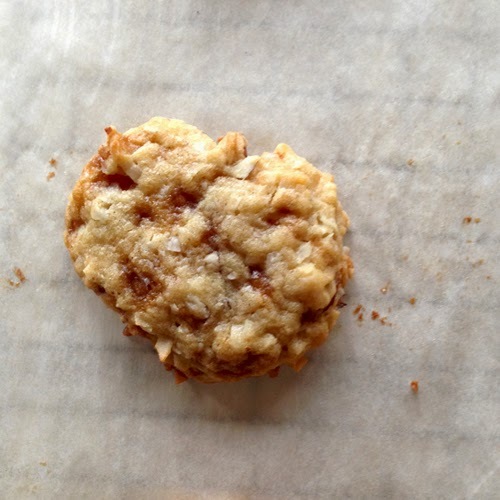 The bumpy texture comes from two cups of coconut and a total of 2 1/4 cups nuts. Their heavenly scent and flavor come from all of those things in addition to the 3/4 cup toffee bits. Mmmmm. They're chewy, buttery, nutty, sweet, and deeply satisfying. 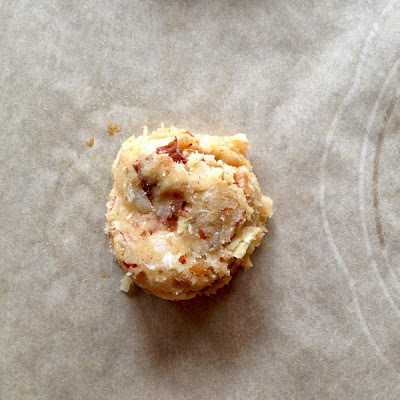 Trust me--if you like all of the previously mentioned ingredients, you will love these cookies. But if you are not a coconut fan, don't bother. These are not for you. My coconut and toffee loving sister-in-law declared these "perfect." Try 'em. 2. Cream butter, shortening and sugars. Beat in baking soda and salt. Beat in vanilla extract and eggs. Note: I like to keep my cookie dough in the fridge, or make and freeze dough balls. If you do that with these, be sure to flatten slightly before baking. When I just popped them in the oven after having been frozen, they didn't spread enough, and I was left with cookie balls, rather than regular cookies. They tasted okay, but not as good as they did when they were flat. Makes about 4 dozen 3-inch diameter cookies, I think. Be sure to smoosh the top a bit before baking.